Designing for anyone in the wedding industry is a tall order, but when it's someone at The Knot (the Site Director, no less!) and a dear friend, we knew we had to step up in a major (read: beautiful) way. 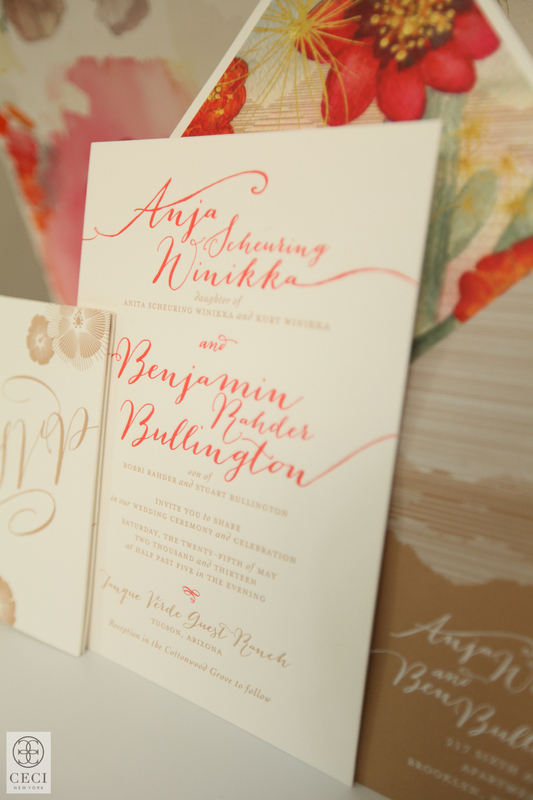 We set the tone for Ceci Bride Anja's chic wedding with a sandy tan and coral letterpress printed invitation suite featuring stylized typography on a thick white stock. But, it was the commissioned watercolor painting by Ceci Johnson that served up the wow factor and introduced her guests to the the locale, the energy and, of course, the gorgeous color palette stolen from an Arizona sunset. We even outlined the mountain ranges surrounding the area with white foil stamping on the sand-colored reply envelope. 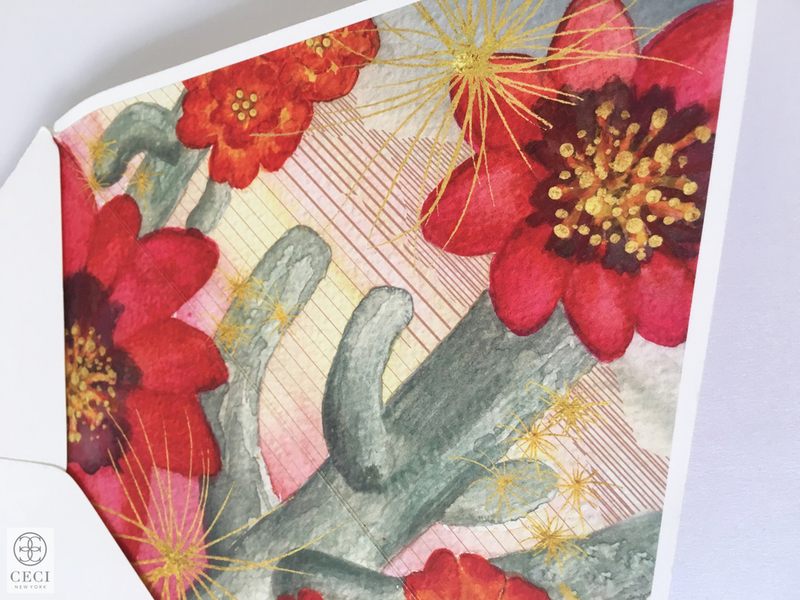 With no shortage of inspiration between the sunsets and unique flora naturally found in Tucson, the vision was to capture and create a unique print that Ceci achieved with watercolor. This beautiful yet relaxed suite really felt like a magical oasis in the middle of the desert. 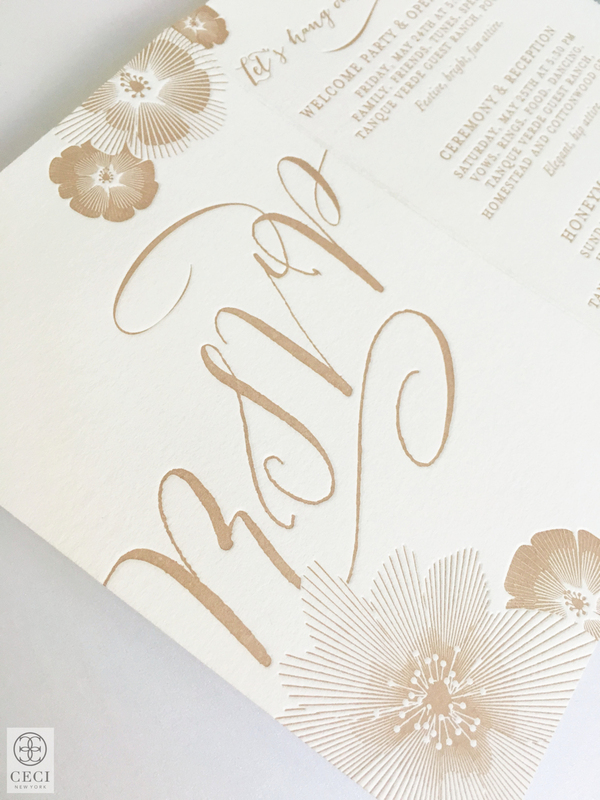 DESIGN DETAILS: Ceci Couture wedding invitation suite custom printed with 2 colors of letterpress on thick pearl white paper stock. A custom hand-painted watercolor by Ceci Johnson adorns the mailing envelope interior featuring colorful pops and washes. All of the weekend and reply details are contained in the folding and perforated 3 panel event reply card featuring the sand letterpress while the reply envelope shows off the mountain range outlines in a white foil stamped design. 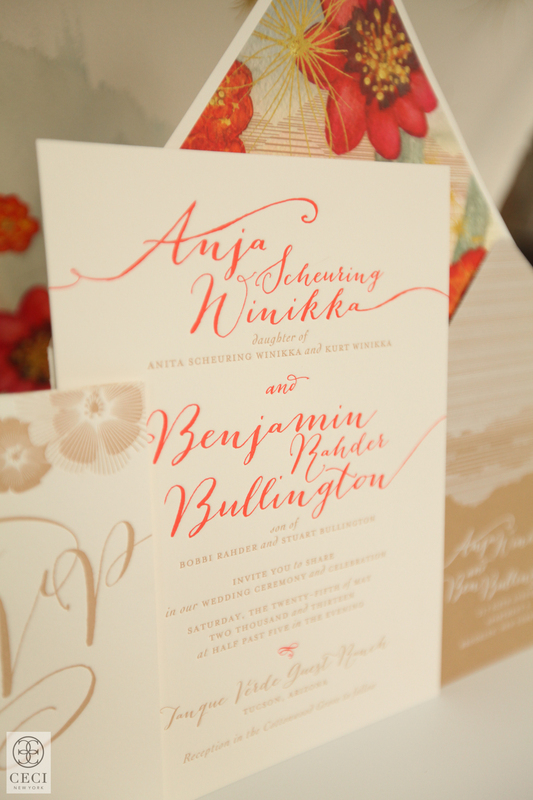 The rest of the suite details were letterpress printed with one color. 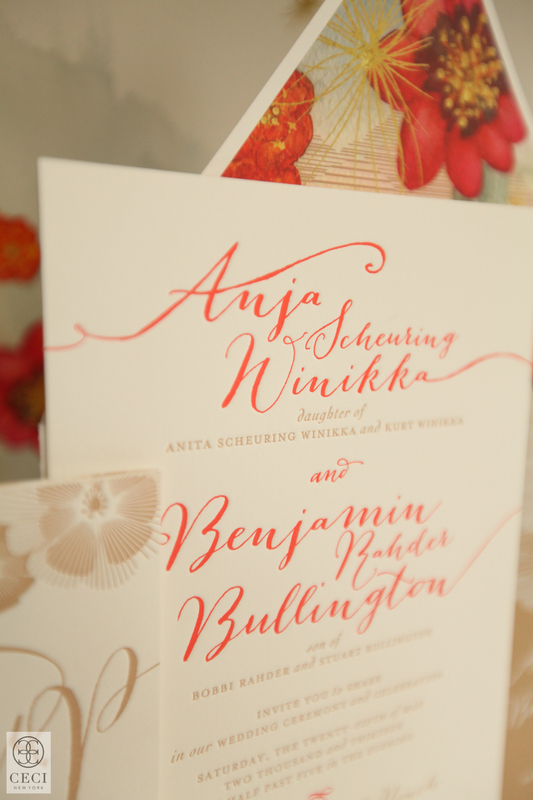 Looking for Invitations? Want to design with us? Book your complimentary consultation with one of our experts to get started.